Inspection modules including: inspections, invoices, facilities/addresses, complaints, equipment maintenance, invoices, reports and more. 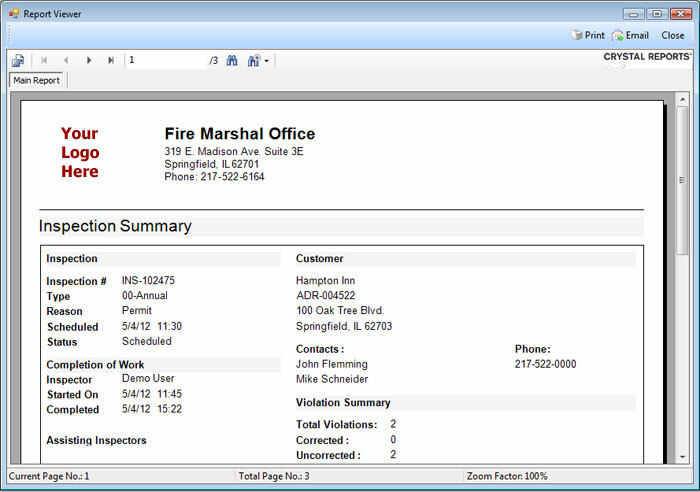 Generate, print, export or email 15+ professional reports on demand. Easily manage inspections and reinspections, along with uncorrected violations. Automate customer billing for easy preparation of invoices. Bulk assign inspections to facilities using our wizard. Import your adopted code books or create your own. Create and customize checklists that can be added to any inspection. Attach files or photos to many record types within the system. Robust security and audit logging, including the ability to lock records. Built-in customizable help system to tailor screen hints and help documentation. Create powerful data queries and export to CSV, Microsoft Excel or XML formats. Data synchronization capabilities to work offline or disconnected from your network. Follows industry standards and best practices for public safety and inspections. Complete inspections in the field from your laptop or Tablet PC.